The Game Played With A Flying Disc! 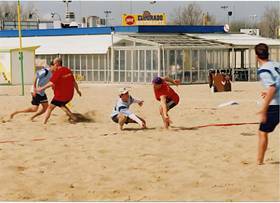 There are some variations to the rules depending on whether it is indoor, outdoor or beach play, and also the country the game is being played in. Before games begin, team captains agree on the rules being adopted and these are then in play for the duration of the game or tournament. A player may only hold onto the disc for a maximum of 10 seconds (outdoors), 8 seconds (indoors), and 7 seconds (certain tournaments). The defender will usually count out-loud as the �stall count� progresses. A turnover is effected if the disc is not released within the time. When the disc is released, a call of �up� is usually given to make others aware of its flight. 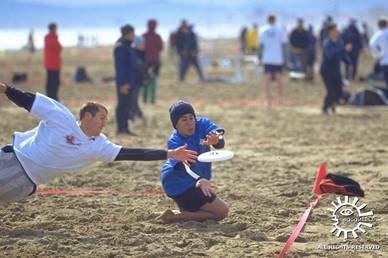 Unlike most games, even in international competition Ultimate is played with no referee! Call foul calls and rule infringements, are made by the players themselves. This means that anger, boisterous behaviour, swearing, foul play, cheating, and many of the other attributes normally associated with sports players, have no place on the Ultimate field. In Europe and increasingly in the USA competitions generally have a prize awarded to the team that has shown the most spirit in the games and had the most fun. 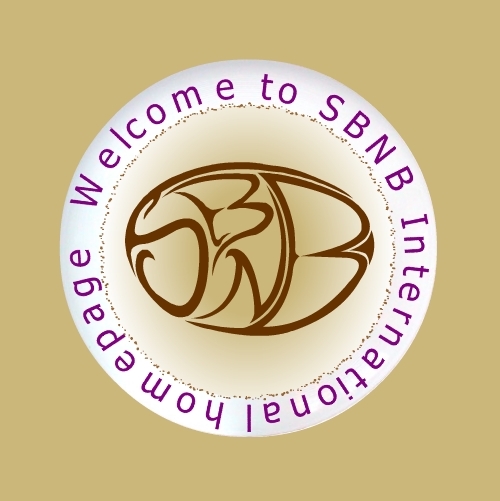 This �Spirit� prize is highly sought after, and could be renamed the fair play prize. Ultimate players have to learn honesty and the principles of good sportsmanship in order to play effectively, and this should be understood from the outset. Infringements of the rules in Ultimate are always called up by the players themselves due to the absence of a referee. Fouls can be called by offensive or defensive players depending on the rule infringement. If the violation results in a dropped or missed catch and it is agreed by both players that a violation took place then the disc is considered to be caught (regardless as to whether it is in the end zone). If the call is contested (One player disagrees with the call), the disc is returned to the thrower in the position from whence it came. Obviously playing to the spirit of the game is key to fair foul calls. Physical contact that interrupts movement, throwing or catching. Travelling � Movement of the pivot foot, or steps during a throw. Where can you play ultimate? Everywhere! 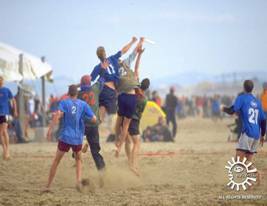 Ultimate is played outdoor, indoor and of course on the beach.